1) Am I not living for Christ if I don’t undergo a fiery trial? 2) Am I supposed to celebrate a trial or suffering? 3) In reading 4:19, does God will us to suffer? 12 Dear friends, don’t be surprised when the fiery ordeal comes among you to test you as if something unusual were happening to you. 13 Instead, rejoice as you share in the sufferings of Christ, so that you may also rejoice with great joy when his glory is revealed. 14 If you are ridiculed for the name of Christ, you are blessed, because the Spirit of glory and of God rests on you. 15 Let none of you suffer as a murderer, a thief, an evildoer, or a meddler. 16 But if anyone suffers as a Christian, let him not be ashamed but let him glorify God in having that name. 17 For the time has come for judgment to begin with God ‘s household, and if it begins with us, what will the outcome be for those who disobey the gospel of God? 18 And if a righteous person is saved with difficulty, what will become of the ungodly and the sinner? 19 So then, let those who suffer according to God’s will entrust themselves to a faithful Creator while doing what is good. The apostle Peter is writing to the body of Christ who is quite literally under fire and have, therefore, been exiled and scattered. The great city of Rome has burned down, people are displaced from their homes and livelihoods, separated from their communities, and in survival mode trying stay alive and care for their families while mourning lives of lost loved ones. By a false testimony, this devastation was blamed on the Christians. It is common understanding that the leader, Nero, himself burned the city and needed a scapegoat. The apostle Peter is writing to people whose devotion to follow Christ is the reason they are fearing for their lives and fleeing their communities. But persecution is wide spread and running away is not a simple answer. As Peter encourages these people to stand strong in Christ, he sprinkles reminders of those who have suffered before them for the Gospel of Christ and for striving to live righteously like prophets of the Old Testament (1:10), but primarily Christ himself, who lived perfectly and fulfilled prophecies, yet died a persecuted death to take on our judgement. On reading 1 Peter 4:13, one may find it an odd command to “rejoice as you share in the sufferings of Christ.” Even the strongest of Christians might honestly feel they were lying to themselves and others if they said they were celebrating at the same time they were hurting. Though the persecuted church is innocently enduring unfathomable pains, there is something greater to celebrate. If they are, “insulted for the name of Christ,” they are suffering for His honor. This is a fruit-bearing process for believers who have been cleansed from unrighteousness, and have been spared a greater judgment by God. They have been raised from their spiritual dead state to being alive in Christ and given an eternal, incorruptible inheritance. The joy of this undeserved grace is a gift worthy of rejoicing! Peter isn’t saying to celebrate hardship. Rather, joy is available because of our rich inheritance in Christ. Much like the timeless example of a laboring mother rejoicing in the coming of her baby. Have you ever felt like the only way you could live for Christ is if He calls you to a dramatic life change of service? Sometimes God does call His people to these things. Peter reminds believers that even Christ was persecuted while being righteous (1 Peter 2:19-21). Our fundamental call is to strive for righteous living in the quiet times and in the difficult struggles, wherever we are in life. –humble yourselves before others and God (5:5-6). When we, in God’s strength, live out these instructions (especially in times of difficulty), we are living out a testimony for Christ. In the daily pantry-type decisions (as noted in the Journey Study) to honor God instead of escaping discomfort, thus “adorning the doctrine of God our Savior” (Titus 2:10; Nancy DeMoss Wolgemuth notes this application in her book, Adorned). Our focus is not the trial, but rather upholding Christ in every action. Have you ever followed through on a decision that aligned with Scripture, yet things didn’t go smoothly? 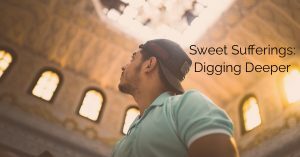 A breadwinner learns their employer is participating in something against Scripture and decides to look for a different job. Someone who reaches out and loves on the outcast of the group, facing their own isolation. A person who offers to pray for a co-worker is fired for making others uncomfortable. Striving to honor Christ leads to trial and suffering. Trials and suffering may take on different forms, but 1 Peter is specifically referring to one who is suffering despite the fact that they are doing good. The sadness or difficulty of a situation is not to be down-played or dismissed. But, despite the type of suffering, be encouraged and strengthened as a Christian to look beyond the physical trial and re-connect with the joy of a greater news. Christ is risen and His people will one day share in Christ’s incorruptible glory! Sufferings do not have power to take that hope away from us! When reflecting on those before us who have endured persecution for their faith in Christ (not due to evil deeds), it is common to pause in fear. In this view, the cost is worth it! If God, in His sovereignty were to “will” suffering and trials, He would only do so for a purpose of eternal value in His Bride, the Church, and that His Name would be made known that all may know that He alone is God. We see with cloudy vision, but He sees perfectly. What we can confidently know is that this God is entirely trustworthy! Catch up with Sweet Sufferings! 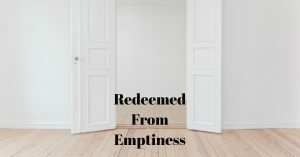 Check out Redeemed From Emptiness! 1) Who is Peter writing to in these verses? 2) Who is the adversary Peter is writing about and how does he attack? 3) How do we resist our adversary? 8 Be sober-minded, be alert. Your adversary the devil is prowling around like a roaring lion, looking for anyone he can devour. 9 Resist him, firm in the faith, knowing that the same kind of sufferings are being experienced by your fellow believers throughout the world. 10 The God of all grace, who called you to his eternal glory in Christ, will himself restore, establish, strengthen, and support you after you have suffered a little while. 11 To him be dominion forever. Amen. 12 Through Silvanus, a faithful brother (as I consider him), I have written to you briefly in order to encourage you and to testify that this is the true grace of God. Stand firm in it! 13 She who is in Babylon, chosen together with you, sends you greetings, as does Mark, my son. 14 Greet one another with a kiss of love. Peace to all of you who are in Christ. 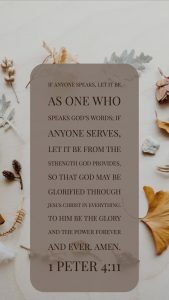 Peter addresses this letter to believers living in exile in 1:1, but in 1 Peter 5:1-4, he specifically writes to the elders and 1 Peter 5:5 addresses young men. However, the second half of 1 Peter 5:5 and following is written to both groups. Who were these elders and young men? Elder is not simply a term to describe age. The Greek word Peter uses, “presbyteros”, refers to those in a position over others or an overseer within the church. They would have been strong believers who had been walking in the faith. The younger men mentioned in verse 5 refer to those who sit under the elders. They would have been men in the church who were not elders and would have probably been less spiritually mature than the elders. After giving them each specific instruction, Peter then turns his attention on both groups. He continues with words of advice and warning intended for both groups of people, which is what we find in these verses. These verses are very clear there is an adversary in the devil. Peter specifically describes this adversary as a roaring lion. In order to understand our enemy, we must look to other parts of the Bible to learn who he truly is. Both Ezekiel 28 and Isaiah 14 introduce the devil as a fallen angel cast from Heaven due to pride, thinking he could become god himself. Job 1:7 informs us this adversary, Satan, roams the earth going to and fro. Another translation of the Hebrew, “accuser”, tells us he looks for those to accuse. This is precisely what he is doing in the book of Job, looking for one to accuse; this is still his aim! Peter paints a description of a lion ready to attack when he finds the weak, separated member of the pack. The devil will attack when he sees the greatest opening to do maximum damage. These attacks look different depending on each person, but John 8:44 reminds us our enemy is the father of lies. His attacks are not truth and should not be held as such. After describing the adversary, Peter doesn’t leave his readers to wonder what to do. Instead, Peter gives them specific advice on how to deal with this adversary. These elders and young men are to resist him and stand firm. The beginning of verse 8 also reminds readers to be sober-minded and alert. Be on the lookout for the attack that is coming. It’s no secret the enemy is looking ready to attack at the opportune moment; believers must be ready. Peter also reminds them they are not alone in their suffering. Other believers are experiencing suffering alongside them. Matthew Henry writes, “It was the faith of these people that Satan aimed at; if he could overturn their faith, and draw them into apostasy, then he knew he should gain his point, and ruin their souls; therefore, to destroy their faith, he raises bitter persecutions, and sets the grand potentates of the world against them. This strong trial and temptation they must resist, by being well-grounded, resolute, and steadfast in the faith.” These believers must cling to the truth they know of the One True God who saved their souls. They must cling to their salvation in what Jesus has already done on their behalf and not give in to the lies their enemy is aiming at them. Lastly, they must never forget they are not alone. Believers throughout the world experience the similar attacks from their common enemy. While these verses are addressed in the original context to the elders and young men Peter was writing to, there is still an application for us. We may not be pastors or hold the specific office of elder within the Church, but Peter’s words are still a warning to us. These words can be applied to those who have been walking with Jesus for many years and those who are new to a relationship with Him. 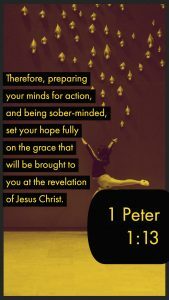 As believers, we are members of the global, timeless Church and we should heed the advice and warnings Peter gives. Our adversary is still alive and well just as he was when Peter wrote these verses. Matthew Henry’s Commentary explains that Peter describes the enemy by his character. First, he is our adversary, our enemy, who wants only to hurt and destroy us. Second, Peter calls him the devil or Satan whose role is to accuse believers. Third, he is a roaring lion on the prowl. Lions do not hunt the strong animals who can defend themselves. Instead, they look for the weak or hurt animal, separated from the pack. Satan is the same; he is on the hunt looking for the weak believer separated from community to attack. It’s easier to attack a weak believer without community as there is less chance of defense. The enemy will lie to believers in order to accomplish his goals. We must recognize our enemy for exactly who he is, and respond accordingly with truth! We are to resist our adversary stand firm just as the believers Peter is writing to. The believers in 1 Peter are reminded of other believers suffering and we too must remember there are believers around the world experiencing similar sufferings to us. Paul Marshall of Freedom House states that 80% of the world’s believers, those who are genuinely walking with Jesus and living out their faith, live in persecution. Just as a lion looks for the one separated from the pack, our adversary wants to separate us from other believers. He wants us to feel alone, not belonging to a larger community of believers. When he separates us from other believers, his attack becomes much easier. We need biblical community around us reminding us we are not in this battle alone. We must also remember that while we may be in the middle of a battle, the war has already been won. 1 Peter 5:2 reminds us we already share in the glory! No matter what lies the devil is telling us, we must cling to the truth and stand firm. Once we place our faith in Jesus, we are redeemed from all we have ever done and will ever do. Jesus did it all when He went to the Cross bearing all our sin and shame then rising from the grave, defeating death and the devil himself. We fight our battles, but we are never, ever alone and never without hope! 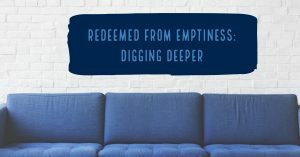 Catch up with Redeemed From Emptiness! This is Incorruptible Week Two! by the precious blood of Christ. Joshua 2 tells the story of Rahab. Giving away her body for money, she was used and abused. Hers was an empty life. Enough to know that if He would provide her protection, she would turn her back on her people. True to His Word, as the walls of Jericho collapsed around her, Rahab’s house was left untouched and her family was saved. Rahab married a Hebrew man, was rescued from prostitution, was welcomed into the blessings of Yahweh, and grafted into the lineage of Christ. brought about new life for Rahab. we are free to walk confidently into the redeeming grace He offers. Ruth was a Moabite widow who followed her mother-in-law Naomi, against cultural custom, back to Israel. She was a foreigner without food and protection of a husband. If anyone felt empty, it was Ruth. Like Rahab, she chose to be in exile, displaced from her own land to follow Naomi and her God. Through events only God could ordain, Ruth became the protected wife of Boaz and mother to Obed, another generation in the lineage of Jesus. Ruth found fullness, life, and purpose. 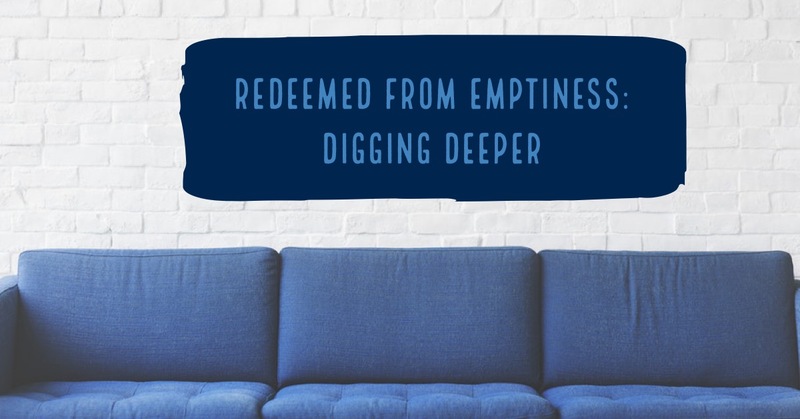 As we lay ourselves humbly at His feet, the Lord faithfully redeems our empty places. In Acts 9, we meet Saul. Well-known as murderer and persecutor of Christians, Saul made it his life mission to kill all who claimed the name of Jesus. Death always leads to emptiness. But Jesus interrupted Saul’s crusades in a blinding moment of awe-filled truth where Saul surrendered to radical grace. 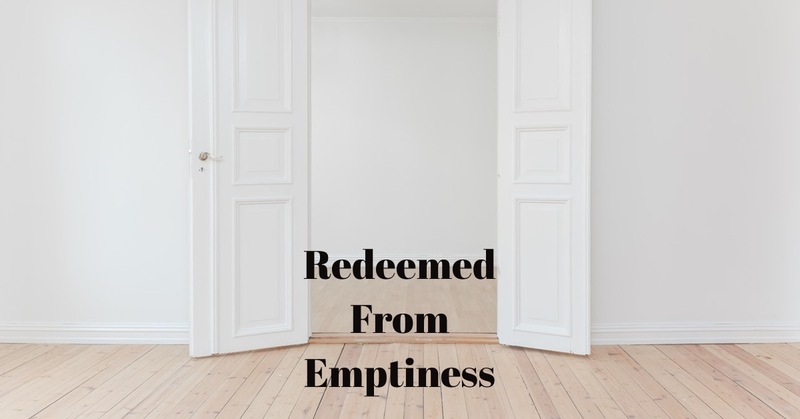 Having been redeemed from his old way of thinking and living life, Saul-turned-Paul spent the remainder of his days proclaiming Christ, forever exiled from the life he’d once so passionately known. but grace captured his heart, exchanging life for death. As we accept the redemptive grace of God, we become new people. Each of these people were exiles in one form or another. Each heard and understood the character of God through His people. Each found hope in the midst of their exile because of God’s faithful, trustworthy character. Peter reminds us that we are exiles too. Separated here on earth from the One in Heaven who crafted our hearts to beat in rhythm with His. Aliens here with broken relationships, heartache, loss, destruction, and sufferings coming in all shapes and sizes. Exile is not forever, Sisters. We can trust that truth because of our God’s character! Jesus says He will restore us, confirm us, strengthen us, and establish us! Restore – to repair or renovate so as to return it to its original condition. Confirm – to establish the truth or correctness of something believed. Strengthen – to make or become stronger. Establish – to achieve permanent acceptance or recognition for. As we look at those definitions we see redemption so clearly! and established them firmly in the incorruptible inheritance that was to come. but it’s only ours to claim if we accept the gift of salvation. Salvation is a free gift from God that buys back (redeems) us from the chains of Sin and Death, adopting us as His very own daughters. Jesus Christ, the only mediator (1 Timothy 2:5) between humanity and God, wrapped Himself in human flesh (1 Peter 1:20-21), became one of us, was sinless like none of us, and willingly laid His life down on the cross that each of us might know Him, trust His character, and be redeemed from emptiness! 1) Who are the elect exiles? 2) What is the Dispersion? 3) What do we learn from this passage about the recipients of this letter? Peter, an apostle of Jesus Christ, to those who are elect exiles of the Dispersion in Pontus, Galatia, Cappadocia, Asia, and Bithynia, according to the foreknowledge of God the Father, in the sanctification of the Spirit, for obedience to Jesus Christ and for sprinkling with his blood: May grace and peace be multiplied to you. Peter is writing this letter to a group of believers who are in what is modern day Turkey. These believers refused to join in the practices of the world around them. They were separated and exiled because of their faith. These followers were not in their home land, but had been kicked out and exiled as Christians. Other translations use the words: sojourner or aliens. The main take away from this passage is Peter wrote to those who were far from home. The Dispersion references Jewish believers living in Gentile countries (ie: not Israel). Some were carryovers from the Jewish exile we learn about in the Old Testament. Some came to foreign lands through persecution. The Dispersion laid the ground work for the spread of Christianity because believers were spread throughout modern day Turkey and Europe. In the original context, Peter would have been specifically talking about Jewish believers, but as he came to understand the Gospel included both Jews and Gentiles, the Dispersion, in a boarder context, would have included Gentile believers as well. We learn they were believers who knew the Father, had the power of the Spirit, and desired to live obedient to Christ because they had been sanctified and saved. 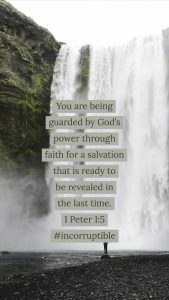 In this letter, Peter is reminding his recipients of those indestructible truths. As we read this passage, we must personally identify with this statement. This world is not our home, but rather a temporary place of residence until Christ returns. Peter called upon the “exiles” to abstain from the “passions of the flesh, which wage war against your soul” (1 Peter 2:10-12) for the sole purpose of pointing those around them to Christ. We are the exiles of this age, pointing people to Him, the one true God and Redeemer. He has given us a promise in the Holy Spirit until He returns to sustain us, to enable us, and to live as exiles until we go to our eternal home. Just as we identify as exiles in a foreign land living in a temporary residence, we can also identify as dispersed believers. The idea of living in this world but not of it, forms a boundary for us as believers. 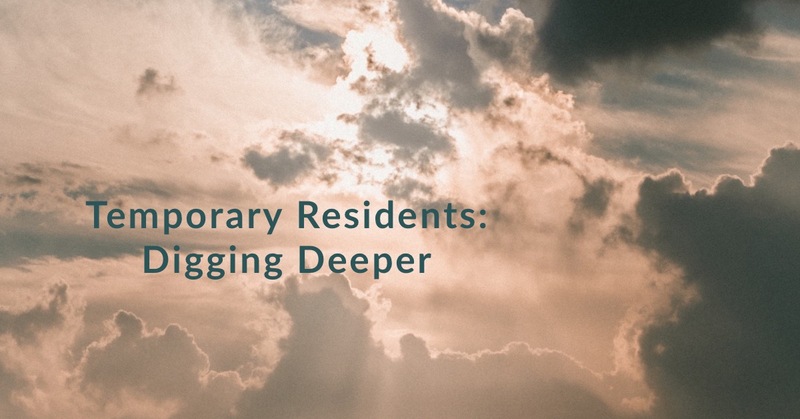 We are to be resident aliens just as the dispersed believers of the days of old, living their lives in pursuit of Christ as residents in a world that consistently pushes back and challenges beliefs. Yet we are also aliens, knowing there is so much more. We live in both realms– as residents pursing Christ in our everyday lives, yet as aliens longing, hoping, and having complete faith He will return to finish what he started 2000 years ago and bring us home! For a very long time, humanity has longed to be in the presence of Christ. As we read a letter that was written almost 2000 years ago, the plight of the dispersed believers desiring to be home does not fall on deaf ears or hard hearts. Rather, we can read this letter and grasp as believers what it means to be “resident aliens” in a world that neither loves our Lord nor, at times, loves us because we serve Him. Our one desire should be to point others toward Christ until He returns to take full ownership of this world back. The war is won, we know the ending! In the meantime, just as believers before us, we pursue Christ in full obedience, knowing the hope of our future is indestructible! 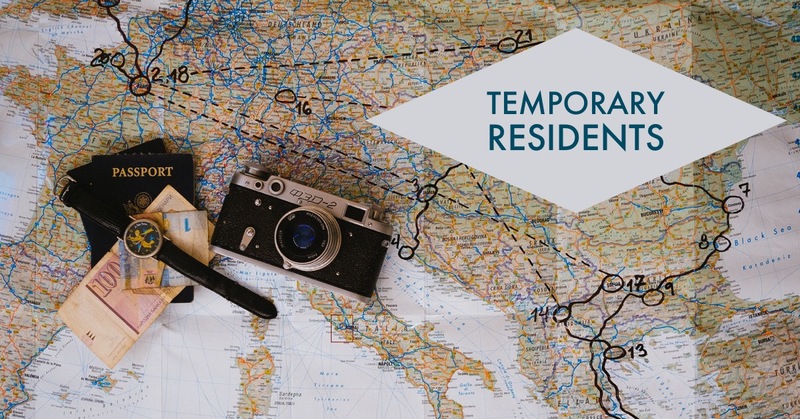 Catch up with Temporary Residents! This is Incorruptible Week One!